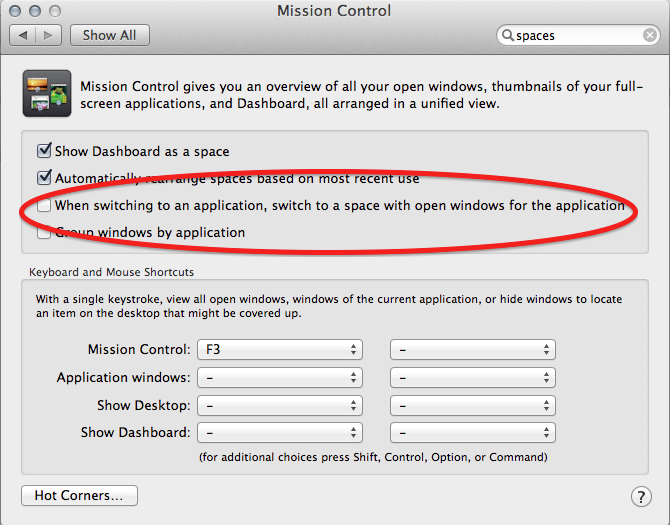 For years I have shunned Apple’s OS X Spaces as useless. I was excited about them for a good 2 minutes, which is how long it took to find out that if I had 2 spaces open, and I opened a browser in the 2nd space, then it flipped back to the 1st space. Completely not the point of having Spaces. So I un-ticked it. Perfect. Now I can have a space for work, a space for homework, with browser and mail and other windows open in each space, and it no longer flips between them except I want it to. This entry was posted in Computers and tagged mac, OS X on 26th January 2013 by Chris F Carroll.